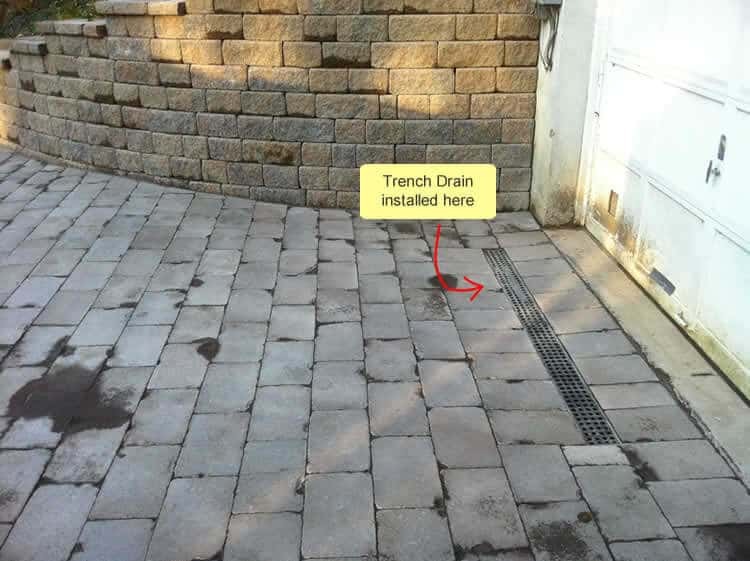 How Clogged Foundation Drainage Caused a Flooded Basement For This New Paltz Homeowner | Masseo Landscape Inc.
We were contacted by a Hudson Valley couple whose basement had flooded for the first time, just after tropical storm Irene. With 2-3 inches of water in the basement, they reached out to us for help. A slightly wet or damp basement can all of a sudden turn into a flooded basement like this. 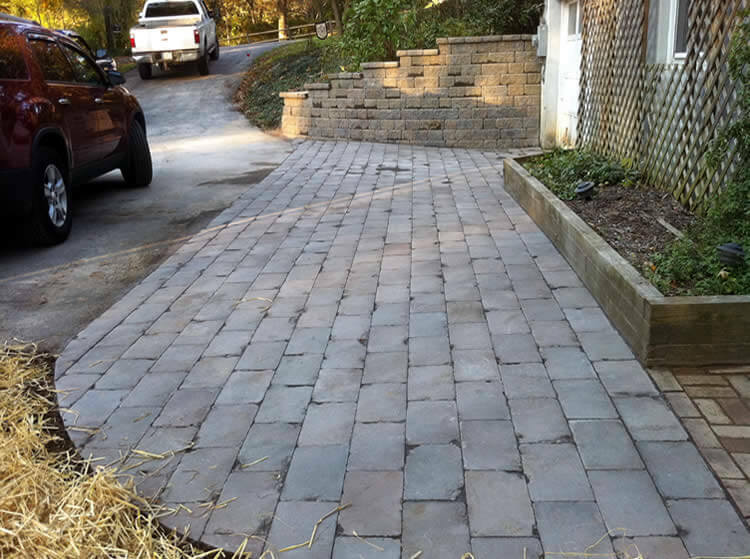 A short phone call with the client also revealed that they had a rotten retaining wall that needed to be replaced. So Mark went out to the client’s house to assess the entire situation. After some poking around, we learned that the driveway was collecting water, partially due to roof run-off being dumped behind the rotting retaining wall, (pictured left). There was also an existing brick patio. Traditional clay-brick holds a considerable amount of moisture as compared to a modern precast paver. These waterlogged clay-bricks tend to break apart when they freeze. Our initial assessment led us to believe the footing drain which encircles the foundation was not functioning. We knew the retaining wall had to be replaced and once we got in there, the footing drain outlet would be exposed. So, that’s where we started digging and our assessment was spot-on. Demolition of the the retaining wall revealed that an old Orangeburg fiber pipe at the outlet of the footing drain was collapsed and deteriorating. These old fiber pipes were used for water drains for about 100 years till about 1970. They’re no longer considered to be an acceptable building material by modern standards. Demolition of the rotten retaining wall revealed this cracked footing drain outlet near the foundation. Here’s a tip we’ve used many times in the past for shoring up an old Orangeburg fiber pipe. First we cut the old pipe back to a point where it’s in good condition. Fernco fitting to join the now reinforced Orangeburg pipe with the new larger diameter drain pipe. Notice the smaller diameter PVC pipe driven inside the old Orangeburg pipe to give it strength. The Fernco fitting will join this old pipe with the new larger diameter green colored drain pipe in the image below. Water needs a place to go. If you’re experiencing moderate basement seepage like our client, this could be a sign your foundation drainage is blocked. Sometimes this can go on for years, eroding your foundation underground. Basement flooding usually occurs in the spring or after a huge rain event like we had with tropical storm Irene. When the ground is super saturated, the water table comes right up with no place to exit. So it seeps through the slab of your foundation. Often times a clogged exit pipe for the footing drain is the culprit. Pictured here is the blocked exit pipe for the footing drain. The blockage was many feet from the outlet consisting of about 20 feet of packed mud. 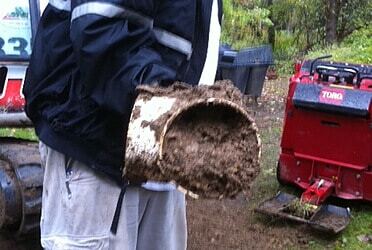 When footing drains fail, typically we find clogged exit pipes like this to be the culprit. Sometimes you get lucky and the blockage is at the exit where you can see it. Clearing the obstruction fixes it. Unfortunately for this client there were multiple foundation drainage problems needing attention. As is often the case, all of the problems were related to the exit pipes of the footing drain and not the footing drain itself. Replacing the footing drain would mean digging up the perimeter of the foundation. Not fun and much more costly. When the storm water around your home is managed correctly you won’t have a wet leaky basement and the foundation of your home will not be compromised from water damage. For this job, you will notice that there are two pipes running to a serviceable catch basin. The pipe on your left will carry water from the foundation footing drain and the new retaining wall drain. This water is filtered with drain stone. So we can expect it to be cleaned and relatively debris-free. 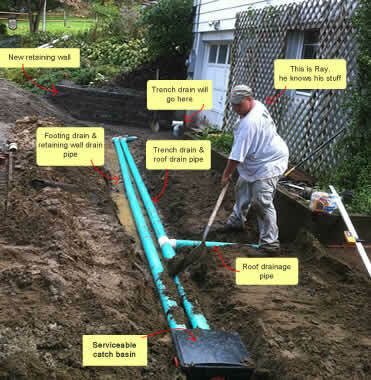 The pipe on the right with the “Tee” is carrying “surface water” from the roof and the driveway trench drain. Surface water from the roof usually has debris like leaves and grit from the roof, which is why we have this exit pipe isolated from the more important footing drain pipe. The catch basin is where the two pipes meet and most of the debris will collect. The lid is removable so it can be easily cleaned of debris. 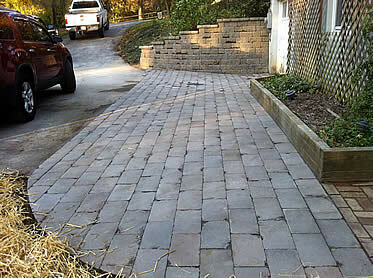 Here’s what the driveway and patio looked like after the work was completed. 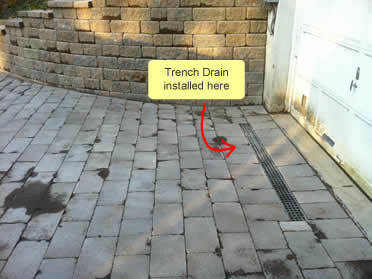 A driveway trench drain was installed to eliminate potential driveway and garage flooding. Sometimes this style of drain is referred to as a “Channel Drain.” They are very affective at quickly moving large amounts of water. This Drain ties into the same underground pipe used for roof run-off. The grade from garage door to trench drain is “back pitched” so no water can enter garage, a good fail safe against flooding due to heavy snow build up and potential late spring flooding. Driveway trench drain installed to prevent garage and driveway flooding. Got a Wet, Leaky Basement? If you’re seeing the signs of water seepage in your basement, get it checked out by a professional. Having your foundation drainage repaired before foundation damage sets in will save you a ton of grief in the long run. Please get in touch, we would be happy to have a no obligation chat with you at your property or over the phone.